I’ve been doing well for ages – hence the quietness on the blog – nothing much to say – and suddenly BAM, out of the blue, I woke up yesterday morning with my usual left knee flare. Actually weather-wise it wasn’t such a clear blue sky – we’d had a few beautiful days and yesterday was a bit dull, but nothing dramatic. I had been having more than the usual twinges in my hands and feet the last couple of weeks, but although it was a bit above the norm it was still only twinges and nothing to write home about. Then yesterday, pooof – VERY painful knee. I had a very bad night’s sleep last night, partly because my sleep is definitely not normal in that I move a lot while asleep – and every time I moved I woke up going ‘OUCH!’ … or words that that effect, and partly because I was thinking oh, no, there’s nothing else for it, I will have to call the doctor in the morning. Those of you who’ve read this blog a bit before will be aware that, while appreciate that it’s ‘free’, I’m not a big fan of the way the NHS is run, and our local surgery in particular, and I was literally dreading it. So how did it go? Well, I’m glad you asked. Are you sitting comfortably? Then I’ll begin. I phoned at 8:30 when the phone lines open and got a message saying ‘You are fourth in the call queue – please hold …’ etc. I was expecting more like ‘You are number 47 in the call queue’ so that was the first of several pleasant surprises! Then when I got through a receptionist answered I was ready to do battle to actually speak to a doctor – not for instance ‘It’s arthritis? I’ll get you a physio appointment’ etc. Yes, the receptionists triage. It’s quite mad, but there we are. Anyway, I said without thinking that I was having an RA flare and got ‘A what, sorry?’ But that was fair enough. When I said ‘A rheumatoid arthritis flare’ that was obviously something on her crib sheet. ‘I’ll see if anything’s available this morning.’ Bloody well better be, I thought, but held my peace! So I waited for the doc to call me back – and he did, within half an hour, and one of the senior partners who I rather like at that. I explained the issue and he said, ‘You’d better come in and we’ll see what we can do. Can you get in for 9:30?’ I said I could and he said ‘I’ll book you in with Dr Smith. *’ I nearly groaned aloud. ‘Is this the same Dr Smith who was a locum a few years ago? I know it’s a common name, but if it’s the same one … I won’t see him!’ (That was some twit who was exceedingly pompous, upset all the patients and nursing staff, ran hours late and told me I’d sprained something when I obviously hadn’t!) He sounded a bit puzzled and said ‘I doubt it – he’s a partner, and he’s very good. He’s not been with us that long.’ I said in that case that was fine then, and toddled in for 9:30. The checking in system said there were three people in front of me and a 28 minute wait – my heart sank ’cause that reminded me of Dr Smith the first, and I thought oh no, perhaps it is him! It wasn’t …. and in fact the wait was only about 20 minutes which is fine. I always say I don’t mind waiting if it means the doctor is providing enough time for each patient and someone else needs that time … if it we me, I’d want a decent amount of time, thank you! When I went in I felt instantly (mentally) better – it was VERY OBVIOUSLY a different guy. I won’t go into physical characteristics but let’s just say Tweedledum versus a stick insect, and quite an age difference too – clearly a different guy. He was very pleasant indeed; he listened to what I had to stay, accepted that I knew my own condition pretty well, examined my knee carefully and asked sensible questions. Good heavens, I thought, have I slipped into a parallel universe? He smiled and said ‘OK, if that’s what you want to try that’s fine. Come back in five days or so if it hasn’t worked and we’ll investigate further.’ Back into parallel universe territory again. And best of all <insert happy dance emoji here, although only a mental happy dance as my knee isn’t up to a physical one> he PRINTED OFF THE PRESCRIPTION. ‘Eh,’ I hear you cry. ‘So what? What’s that got to do with the price of fish, penguin?’ Well … they had what they (the doctors) thought was an all singing, all dancing IT system at one point. The patients, nurses, receptionists (poor things), pharmacy and nursing staff all saw it for what it was but the doctors took a while … they used to press a magic button on their computers and say, ‘There – it’s automatically gone over to the pharmacy. You can pick it up straight away!’ Only you never could! My longest wait was five hours from time of appointment to getting my steroids, and that was only because I effectively staged a sit-in at the surgery until someone printed off a scrip for me, just before they were due to close! So anyway, I took my beautiful, green, shiny (OK, not actually shiny) printed slip over to the chemist and waited about five minutes, if that, and came home with my beautiful, white, fairly shiny steroids, of which I have taken the first dose. I already feel better … but whether that’s the lifting of the stress of thinking ‘I have to phone the surgery’ or the steroids or the fact I had an hour resting with my leg up earlier, I’m not sure! Here’s hoping it’s all better soon – and I hope, you, dear reader, are keeping well and flare free! * Not his real name – did you guess? It was however a very common name. Pride goes before a fall … ouch! I was just doing some snowdrop lifting (sounds a bit like sheep rustling but it isn’t!) in preparation for an art class tomorrow and I managed some penguin landing instead – crash landing! Luckily I’m mostly fine – slight twinges in all the diodes down my right side, to misquote Douglas Adams, but certainly nothing broken or torn or, I think, even sprained. I have a horrible feeling I’m going to be stiff as a board tomorrow though- in muscles as well as joints, so an hour’s drive to the art class isn’t ideal … but I do at least have the snowdrops ready to paint when I get there! It did make me think though … about pride coming before a fall! I should have swallowed my pride and asked hubby (who hates gardening with a passion) to do the digging for me, or at very least have waited until he was in the house before doing it. There I was, outside on a freezing cold morning (the sun had come out and fooled me into thinking it was going to be warmer), and I missed landing on the prongs of the fork (upturned in exactly the way they should NEVER be … but they were) by mere inches! Things could have been a whole lot nastier than they are. A dear, elderly friend died this week and I’ve been blathering on about how her husband (and possibly also my mother) really ought to have panic buttons that link through to emergency services or something similar, for occasions just such as this, since they’re on their own, and then I go and have a tumble when I’m on my own – and I could have just waited until hubby was home. Silly Penguin! Perhaps I should have made that a new year’s resolution, since I find myself also thinking a lot about (if not generally preaching about) cutting down on plastic use, but fairly dismally failing to do so as yet. ‘Must try harder!’ to accurately quote most of my school reports! Blood test sorted – for this month at least! Incredible – the surgery being polite and helpful! What’s going on?! I just phoned the surgery to book my annual arthritis review with the nurse, and she asked if I’d had the fasting blood test yet, as should have in advance. I explained that I’d tried but unfortunately I’d been in twice and they’d run out of slots (you have to turn up on the morning, you can’t normally book an appointment.) She explained that half the staff are off sick at the moment and they’re really struggling – I really appreciated the frankness and honestly, and let’s face it, with a combination of the stress they’re under a waiting room full of germy patients every day, it’s hardly surprising! She said that the best thing to do was come really early and wait outside – which is interesting because that’s something they were VERY strongly discouraging a few years ago and I know the phlebotomist I saw last time was moaning that if people would only spread themselves out a bit and not all come first thing, they wouldn’t have the problem – obviously no one’s talking to each other again! Anyway, I pointed out that thanks to my arthritis I couldn’t come and stand outside for 20 minutes in the freezing cold just to try and get a ticket – there’s no seating out there at all and no shelter from the rain. She then said that if I didn’t mind a really early appointment the nurses were running an early clinic in February to try to catch up. Well – that solves all my problems – no queuing outside, no waiting for an hour to be seen because I’ve got the first appointment, no having to take time out of work time because it’s well before work starts, and no sitting starving because I’ve missed breakfast – because I’ll have had the test before my normal breakfast time. The only issue for me is going to be remembering about it! Thank goodness for technology. I’ve put a note on my online calendar reminding myself the day before to set up an alarm on my phone and iPad to wake me up half an hour earlier than normal as the appointment is actually at normal ‘getting up time’. So … how long have I been saying, ‘I really must post about that sleep study I took part in?’ Well, for over a month, since I got my results back from Katie, who’s running the ‘QUASAR’ study at the Arthritis Research UK Centre for Epidemiology in Manchester. Oops – bad Penguin! I’ve talked about the study in a few places before, here, and here and in passing here … the latter just proving how woefully slow I am at getting around to blogging. But now I’m finally going to talk about the initial, personal results that Katie has sent me. First of all, here is a week’s worth of data showing correlation (or lack of it) between amount of sleep and symptoms. I’m feeling pretty pleased at the moment. I think the flare has finally, well and truly gone. I finished the steroids yesterday – or rather I should have done. Mysteriously there’s three left so I obviously took 6 or 7 on a couple of days instead of the correct 8. OOPS! Anyway, that’s number one, steroids finished! I’m sure I’ve banged on at least once or twice on this blog about how important it is for the patient to manage their own illness as much as possible, and how important it is to keep a track yourself of your blood test results etc. Weeeeeell, I’ve had this dratted disease for over ten years now and for quite a lot of those years I assiduously kept track of my blood test results, which never showed anything in all that time. And eventually, what with a change in the system that meant we only see the Rheumy nurse once ever three months, and they stopped issuing booklets with the results in, and given that the results never showed anything, I stopped looking. They’re available to me on line but I just didn’t bother. So, fast forward to my last flare, not that long ago, a couple of weeks ago in fact, when the doc told me my bloods were up and I said ‘But that never happens’, turns out it happens more often than i thought. Well the good news is that my poor, neglected blog has been poor and neglected since RA Blog Week in September of last year because I have been really well! I’ve had the odd hip pain but only when in bed, which means I never remember to ask the doc about it because when I’m awake, I’m fine! Other than that I’ve been OK. In fact at the beginning of the month my regular 6-monthly hospital appointment was cancelled at the last minute because the doc was sick. The beleaguered receptionist rang to let me know and to apologise and was very pleasantly surprised when I said, ‘That’s fine – saves me coming in on a horrible, foggy morning and waiting around!’ ‘Oh,’ she said, ‘that’s not the reaction I’ve had so far!’ I pointed out that I felt fine and was busy at work and delighted not to have to waste all our time and she said, ‘You’re the sort of person I LIKE to ring!’ I wished her luck with the rest of the calls and that was that. Heavens to Murgatroyd, the woman with more hobbies than days of the year nearly forgot to write a third annual blog week post with the prompt hobbies! Well, where do I start? I’ve done ‘crafty stuff’ since I was a tot, especially needlework. I can remember learning to sew a simple picture in pale green cotton on a slightly darker green background (fabric that I think was part of the ‘Daisy suit’ I had when I was four … and I can’t have been much more than four when I was sewing that picture). I haven’t stopped since really. On top of that I love to crochet, I do botanical painting/drawing, I’ve recently started making felt (and even taught a class on it recently … don’t ask, just don’t ask … I think I have to do that about once every ten years to remind myself that it is NOT my vocation! ), I read a lot and I’m learning Spanish. I love to go for walks in the country, I’m very interested in entomology and especially plant galls, but natural history in general and … I write a blog … about once a year for Annual RA Blog Week!! RA has slowed down or almost stopped some of my hobbies – crochet is the biggest problem. Just last year I worked on, and completed, a big project crocheting a waistcoat (vest to those across the pond) which went brilliantly, but this year I’m finding my hands just won’t put up with hours at a time of crochet, so I’ve been concentrating more on other things – hey, no shortage of those … especially as I also work full time! The other one is going for walks – I still do, and I still love it, but walks have to be either carefully planned (so that I know I can stop and sit) or just short! On the whole they’re short! Luckily we have three beautiful nature reserves close to where we live so we have a good choice of walks – even though one of the reserves is the size of a postage stamp. Some of the hand sewing I really enjoy has slowed a bit too – I certainly do less of everything than I used to … maybe fatigue … maybe just age! I love all of my hobbies and I’m very grateful that I haven’t had to give any of them up altogether. Having hobbies keeps me (relatively) sane and takes my mind off both work and health problems. In fact painting (when it’s going well) is like a good meditation – I just forget about the world and focus on the painting and can get lost in it for an hour or two and wonder where the time has gone. I find all my hobbies relaxing (unless I’m trying to teach them) and fun, and I think having fun and relaxation in life is vital to keeping things balanced and happy. I’ll never be a master of anything because I’m too busy having fun being a Jack of all trades, but that’s just fine by me. Good heavens – it’s RA Blog week again! 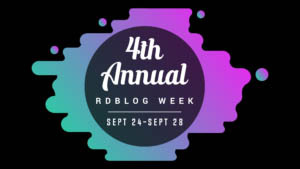 It seems like only yesterday that Rick at RA Diabetes Blog was organising the last RA blog week … I’m not sure where this last year’s gone! Today’s prompt for RA Blog Week is mental health – well, the reason I started this blog in the first place was partly to keep me sane … but then again, the reason I’ve hardly posted the last few years is the fact I haven’t had major RA problems and I therefore haven’t had the commensurate mental health issues. However, I do believe they are, for me, commensurate and correlated. I have mentioned before that if the RA is bad then I can’t sleep, and how important sleep is for me. I think this short post about dreaming and sleeping sums up just how important sleep is for my mental health – and if the RA is bad, then the pain keeps me awake and a downward spiral ensues. I remember once when I had a very bad flare, even though I’d experienced equally bad flares before and come through them, I got very, very down with this one and convinced that I was never going to walk normally again, if at all. WRONG, thankfully – unless I’m in a flare I walk without aids all the time – I’m very lucky that my RA is mild and well-controlled. However, with that flare I was getting hardly any sleep, and when I did sleep I was probably dreaming (knowing me) about life in a wheelchair … although at least in my wheelchair dreams my wheelchair is often a flying one so not so bad … but I digress; the point is that’s an example of how the RA, lack of sleep, feeling low cycle can just spiral down and down. So … how do I stop that happening? Well, there are two main areas to deal with and these are dealing with the RA flare itself and sleeping better. Since there is a Tips and Tricks post coming up later in RA blog week, in which I plan to talk about pain management, I’ll talk a bit about sleeping better here. I’ve never ever been a good sleeper. As a young teenager I used to love listening to the radio between midnight and 2 am … because even though I was supposed to be asleep I was mostly awake anyway, so why not? I’ve always been one for very vivid and usually completely bonkers dreams, which quite often are not pleasant. I also move around a lot in my sleep, talk a lot, shout quite a bit and am generally not a pleasant person to be with … or to be! But just recently, helped by watching some lectures on sleep physiology and also on chronic pain (even though I don’t have chronic pain, thank goodness) and mostly helped by Hubby deciding he was going to buy some fancy Bluetooth lighting, I’ve found two strategies that really help me sleep. The first is very simple – blackout curtains! My, what a difference. I was always waking up at 4am or thereabouts in the summer and the light would be streaming in through the not-so-thick curtains and I’d think ‘Gosh, I’m wide awake’ and then I’d be lying there trying to get back to sleep and not managing very well for often an hour or two. Now, having gone through the painful process of making myself some blackout curtains (I HATE MAKING CURTAINS), I no longer have this problem. The second is the Bluetooth lighting system that hubby got, which at first I thought was sheer indulgence – you can control the lights from your i-Pad? Big, fat, hairy deal (although I did have to admit it was rather fun) – you can also get up and flick a switch, and that’s slightly less lazy… ! But I was wrong, and here’s why. You can control the ‘colour temperature’ of the lighting, and one of the sleep lectures mentioned that warmer, more orange lighting was more conducive to getting to sleep while cooler, more blue lighting was energizing and waking. I can now set the light in my bedroom to gradually dim from normal brightness to ‘nightlight’ over about half an hour. So half an hour before I think I should be trying to sleep, I turn my warm light onto the gradual dimming program and by ‘lights-out time’ the light is very nearly out ,and so am I. Honestly, I feel soooo sleepy at that point most nights and I’m … well, out like a light. This really was never the case before – normal for me would be falling asleep half an hour to an hour after the lights went out. As I said before, good sleep and mental health are inextricably linked for me, so this is a massive help. I am also finding that with better sleep (and other things like Pilates, and consciousness about the position/posture I’m in etc.) I’m physically healthier too, so it’s a win-win … kind of an upward spiral I hope, rather than the downward one I mentioned earlier.